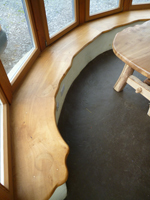 Colin Ritchie's furniture makes a feature of the beautiful, flowing curves of natural edge wood. He sources all of his wood locally from windfall trees, organises to have it milled locally, and seasons the timber on site. 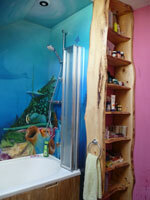 Colin knows each piece of timber "personally". So if you have a specific sized table in mind, or need a beautiful timber window seat made for a particular bay window, or have a certain corner of your house that needs to be shelved, Colin will know exactly the right slab of timber for the job. 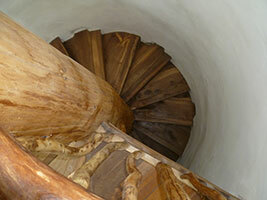 As he sources all of his timber locally, Colin has a wonderful selection of Irish hardwoods. The main species are oak, elm, beech and sweet chestnut. Occassionally, something else may crop up, so please ask if you have a certain timber grain in mind. Take a look at some of his pieces. We hope you enjoy the photos. 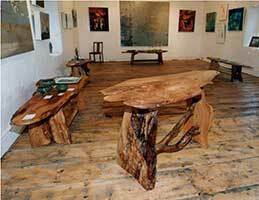 Contact us for availability of featured furniture, prices or commissions. 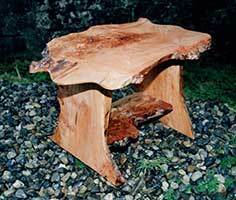 A custom-made piece of natural edge wood furniture is not only functional, it is sculptural. Following nature's lines, the rustic quality of these tables and chairs is highly appealing. 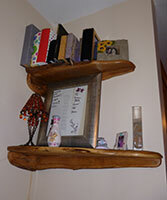 If you would like a piece custom-made for your exact requirements, I would be delighted to chat with you about it. 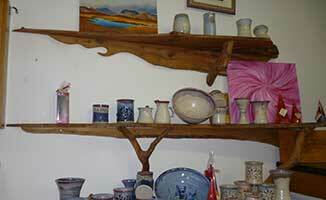 Natural edge shelving looks great in any type of home, whether an old cottage or a modern semi-d. You can transform any room, bringing personality and individual style to it, by adding sculptural shelves and mantle-pieces. Natural edge wood makes the most of the timber's grain, creating subtle and beautiful pieces. Call me for a quote on ++353 (0) 86 809 4241. You will find a selection of kitchen units, vanity units, stairs, window seats and other built-in furniture in this section. Soften the hard edges of any home with natural edge wood. Call me with your ideas on ++353 (0) 86 809 4241. 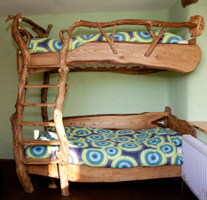 If you have always dreamed of sleeping in a treehouse, take a look at these gorgeous wooden beds. The bunk beds have received the biggest and most enthusiastic reaction by far of all visitors to the Mud and Wood House. 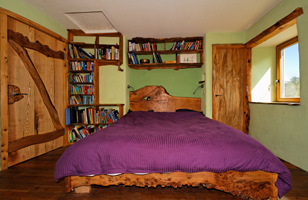 If you would like your own bed tailored exactly to you, get in touch, colin@mudandwood.com.